Sporkman Studios is proud to announce we have signed with up and coming comic publisher, Wikid Publishing. Sporkman's first comic, Sporkman: Conventions is now available for pre-order here in color hardcopy. 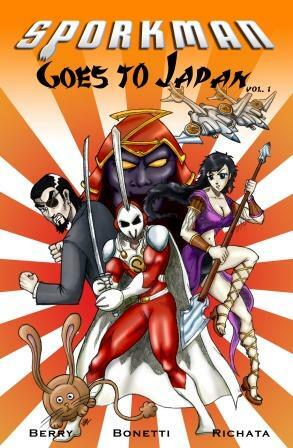 Also, Sporkman Goes to Japan vol 1-3 are now available. Currently it is only available digitally from ComixCentral However, we are currently running an Indiegogo crowd fund campaign to have these issues colorized and bundled as a trade paperback with an exclusive cover and loads of extras. Check it out here and "support the spork". Welcome to www.GETSPORK.com, the official homepage of the superhero known as Sporkman. He's the merging of man and plastic utensil. Here you can find Sporkman merchandise, photos, exclusive Sporkman info, and find out where you can see him next. It's a spoon...it's a fork... it's Sporkman! Be sure to check us out on all of our social media platforms and consider supporting us on Patreon where you can get exclusive items and other cool perks.